^ "Peter Schiff's Euro Pacific Bank Introduces a Silver Backed Debit Card – DGC Magazine". DGC Magazine. August 16, 2016. Retrieved August 2, 2018. ^ a b c Kyle Torpey (May 21, 2014). "Peter Schiff Embraces Bitcoin at Euro Pacific Precious Metals". CryptoCoinsNews. Retrieved December 12, 2014. ^ Task, Aaron (February 6, 2009). "Peter Schiff: Why I'm Right and My Critics Are All Wrong". Yahoo! Finance Tech Ticker. Archived from the original on February 8, 2009. Retrieved May 21, 2010. ^ "5 November 2008". Wall Street Unspun. November 5, 2008. ^ Schiff, Peter (July 16, 2015). "CNBC Futures Now". Retrieved February 27, 2016. ^ Peter Schiff, Joe Scarborough (host) (September 17, 2009). 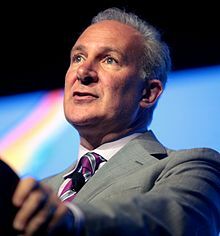 Peter Schiff formally announces his candidacy for U.S. Senate (Television production). New York City: MSNBC. Archived from the original (Flash) on August 14, 2013. Retrieved April 11, 2010. ^ "Lauretti to petition, potentially forcing 7-way GOP primary". The CT Mirror. Retrieved May 13, 2018. ^ Schiff, Peter. "SchiffReport". Youtube. Retrieved September 4, 2016. ^ Schiff, Peter. "Multimedia". Euro Pacific Capital. Retrieved September 4, 2016. ^ "The Peter Meter: Assessing Schiff's predictions". December 20, 2015. Retrieved January 26, 2018. ^ "Peter Schiff Was Wrong". January 25, 2009. Retrieved October 23, 2013.